Gourmet Burger Kitchen isn’t exactly new. It’s been serving burgers in Edinburgh and other parts of the UK for some time now, but with Glasgow’s burger invasion in full swing, the chain decided to open up shop – right next door to Five Guys on St. Vincent Street, no less. 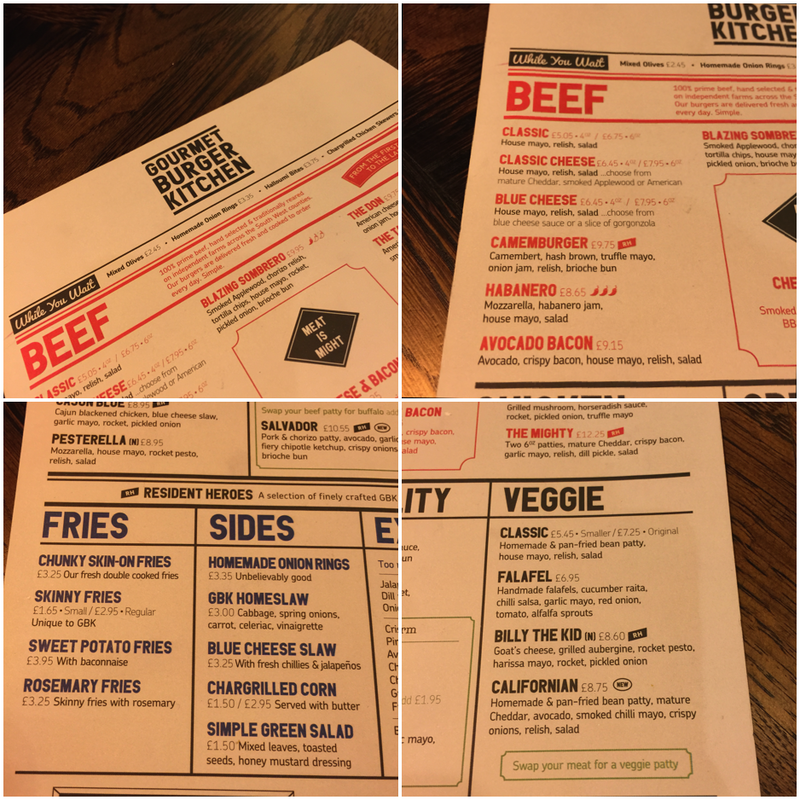 The burger wars are definitely on in Glasgow and we decided to hit up GBK and see what it was all about. Inside, it’s your usual trendy burger place. There’s walls made up of empty cages, more empty cages hanging from the ceiling…empty cages everywhere. It’s a fairly big, open space and there’s a good selection of larger tables and booths too. Once you sit down and have a gander at the menu, you then need to walk to the cashier at the front of the restaurant to place you order. Provide your table number, order, pay, sit down and wait for food. Think Nandos, but with burgers. The menu is pretty big, with a wide selection of burgers on offer. There’s beef, chicken and veggie-based dishes and a few salads too. We went for the Camemburger and the Californian and a side of sweet potato fries with baconnaise. 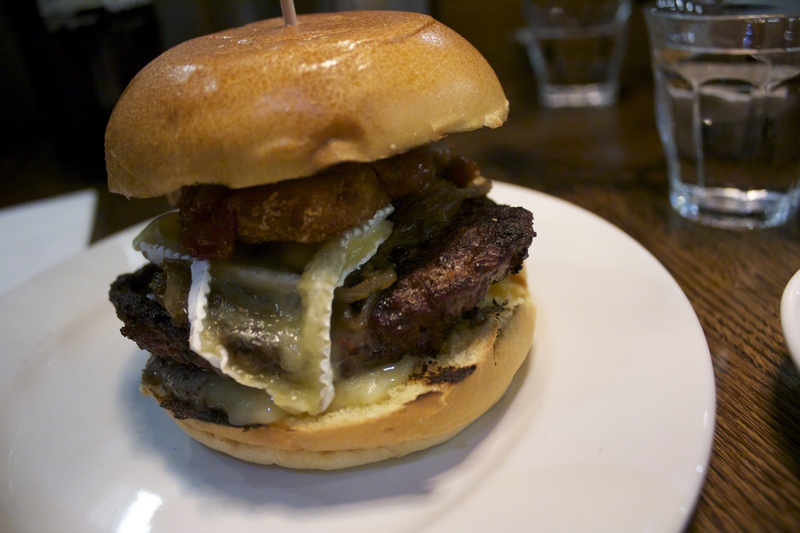 The Camemburger is a beef patty topped with camembert, hash brown, truffle mayo, onion jam and relish on a brioche bun. On paper, it sounded like a winner. 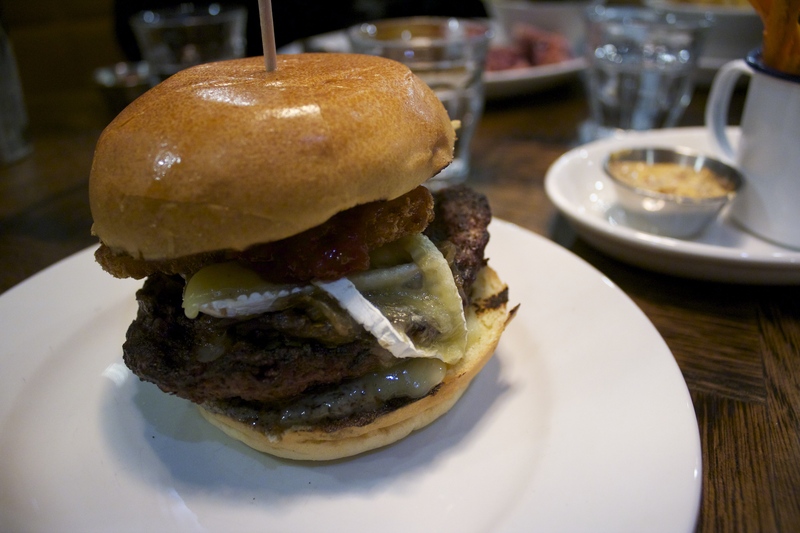 I love camembert and since it’s a nice gooey, melty cheese, I thought it would really work well on a burger – and it does. 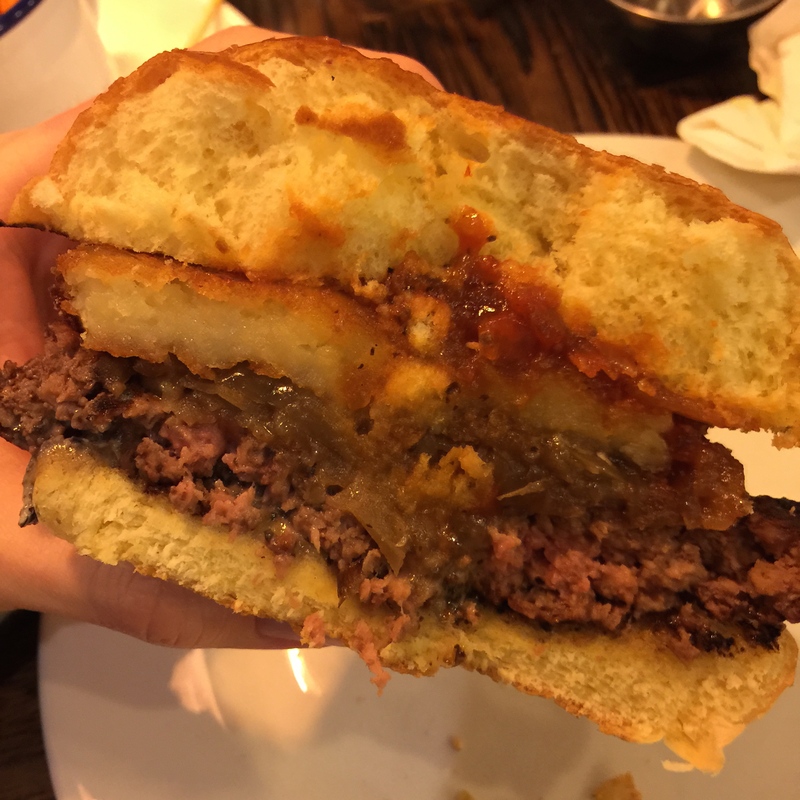 But the problem here is that there isn’t a whole lot of it – and what camembert there is, is completely overshadowed by the hash brown which is unnecessary on this burger. It’s already pretty heavy going and the hash brown just feels like more stodge for the sake of it, without actually adding anything to the flavour. This would have been better without it. The beef was slightly pink in the middle, but was bone dry, lukewarm and pretty tasteless – making an already dry and heavy burger even more so. The Californian is a veggie burger consisting of a pan-fried bean patty with mature cheddar, avocado, smoked chilli mayo, crispy onions, relish and salad. Unlike the Camemburger, this one was good. 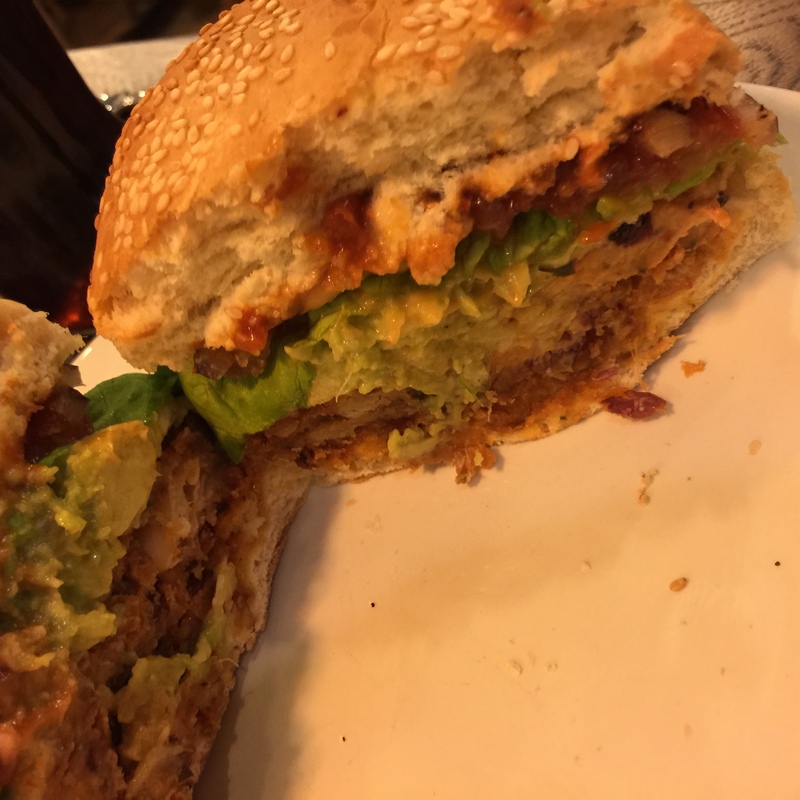 It wasn’t dry, the bean patty had a nice full flavour, the avocado gave it a deliciously creamy texture (let’s just put avocado on all burgers, right?) and the smokey relish finished it off perfectly. It was filling and yet didn’t taste like a big plate of stodge, unlike the burger we’d just tasted prior to it. The bun wasn’t that great and this probably would have been better on the other bun that we had on the Camemburger. One of the better veggie burgers I’ve had recently. 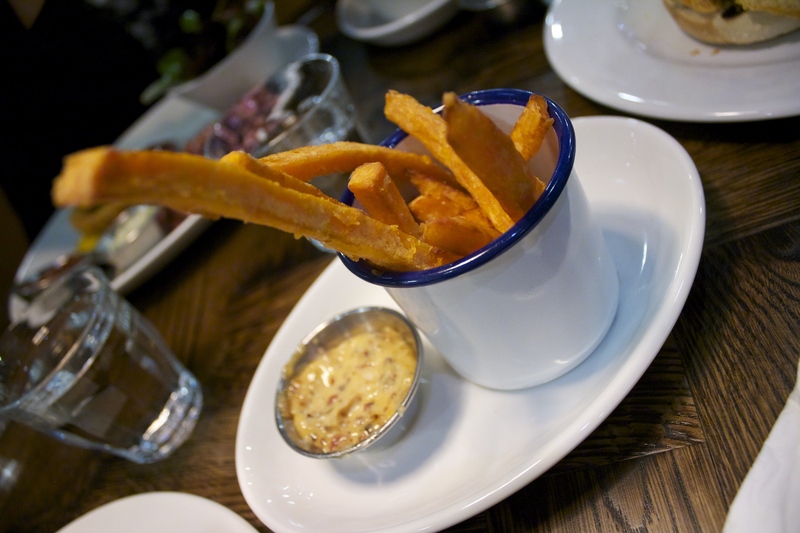 When our sweet potato fries arrived, I couldn’t help but wonder if the member of staff who brought them had gotten hungry on the way. In a tiny little cup (can we stop putting fries in cups? ), there was the smallest handful of fries I think I’ve ever had in Glasgow. I’m not expecting bucket loads, but this just felt silly – particularly for £3.95. Did that one big massive one in the photo count as three or four? If they’d cost £2 or so, I wouldn’t have minded so much, but almost 4 quid?! I later questioned this on Twitter, and Gourmet Burger Kitchen did reply, telling me that this was not normal and that the portion size should have been bigger. They told me that they had passed the photo to their ‘Head of Food’ (hey, can I have that job?). As for taste, they were…decent enough. Not the best sweet potato fries I’ve had, but certainly not the worst. They were nice and crispy and not greasy at all. I’d heard a lot of rave reviews for the baconnaise that comes on the side, but I didn’t find it to be quite as life-changing as people had made out. It was still quite tasty, but certainly not anything to scream about. 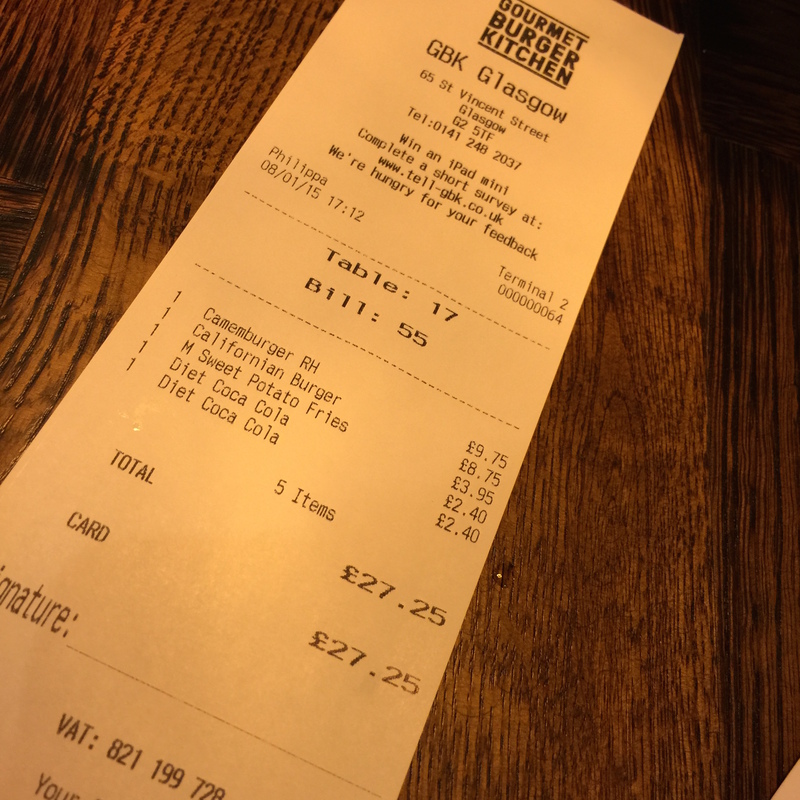 Gourmet Burger Kitchen did feel a little on the pricey side. The Camemburger comes in at £9.75 and any sides cost extra. When you consider that I could have walked across the street to Bread Meats Bread and got a better burger with a side for less and the fact that; in my personal opinion, the Camemburger wasn’t very good, I wouldn’t really rate it in terms of value. 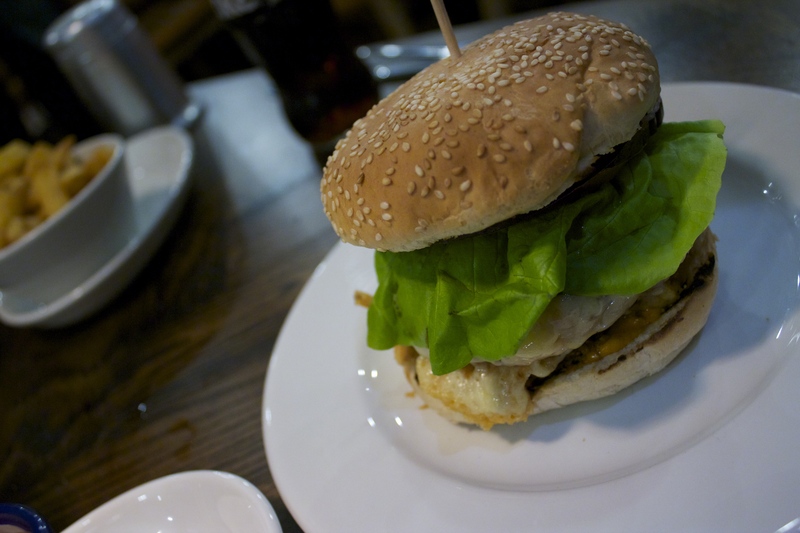 The Californian; on the other hand, was good and if I went back to GBK, I’d probably order it again. A burger outing that was very much a tale of two dishes. 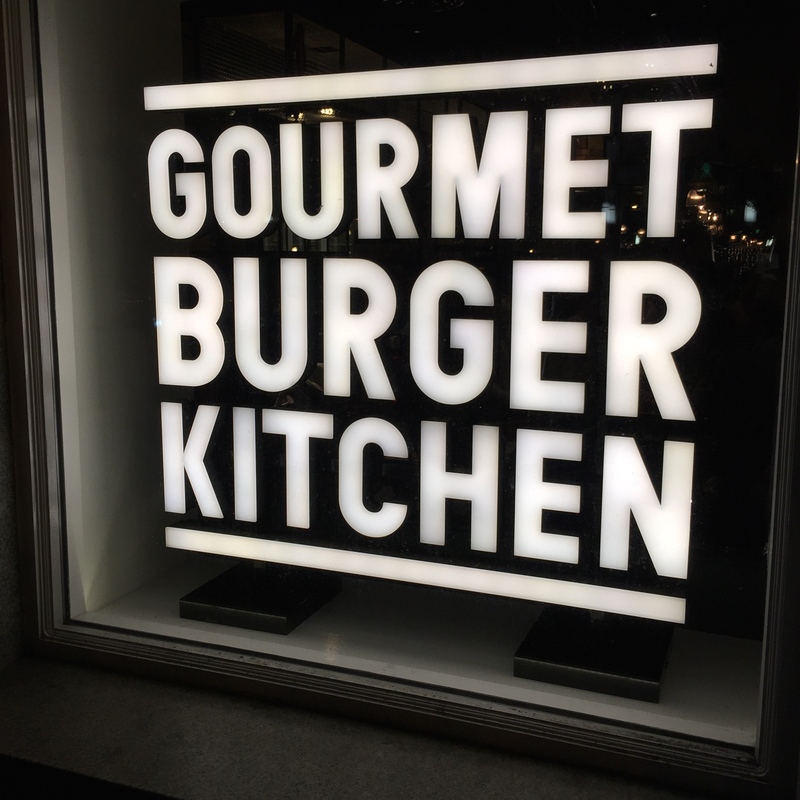 In an already overcrowded market, Gourmet Burger Kitchen did little to stand out on this occasion. + Californian was tasty. Good combination of flavours, a very good veggie burger. – Beef patty was dry and lacked flavour. – Hash brown was unnecessary and made the burger too stodgy. – Tiny portion of sweet potato fries. Tried GBK last night with the boys; all starving after a few beers in the city, and only because Burger Meats Bun is no more (gutted) and the Breads Meats Bread queue was out the door. Food was average, portions underwhelming, service non existent, bill too expensive, and they were all out of skinny fries and brioche buns!!!!! Can’t see this particular franchise lasting the distance on St Vincent St. Nothing much seems to have changed since a year on from this review. I wish I had read it before going over! Portion sizes are small for the relatively high prices. Skinny fries are …well…more like anorexic fries. Feels like you are eating air – but maybe some people are into that sort of thing. 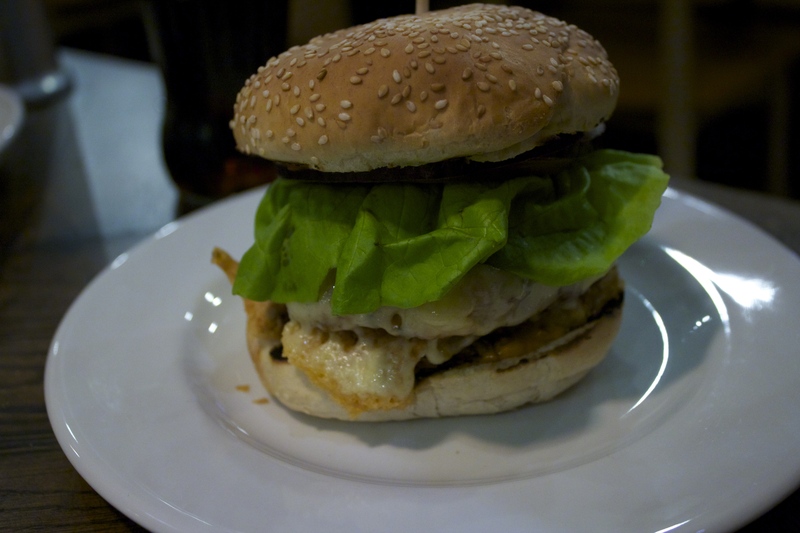 The only redeeming factor is that they do a Kiwi burger – I do love an egg on my burger – but its not enough for my return custom.